We're looking for the best Scarsdale has to offer and passing it on to you! As I have written in the past, lowering the property taxes on a property will automatically increase the value of that property, and make it more desirable to perspective buyers. If you own a property, or are in contract to purchase a property, New York State law provides that you can grieve your property taxes. Buyers like seeing that the seller is proactively lowering the taxes, as it makes the buyer's life much easier once they become the new owner. The property tax grievance period for Yonkers is just a few weeks away. Would you like our list of professionals who can help with the process of reducing your property taxes? For further information contact Five Corners Properties today! 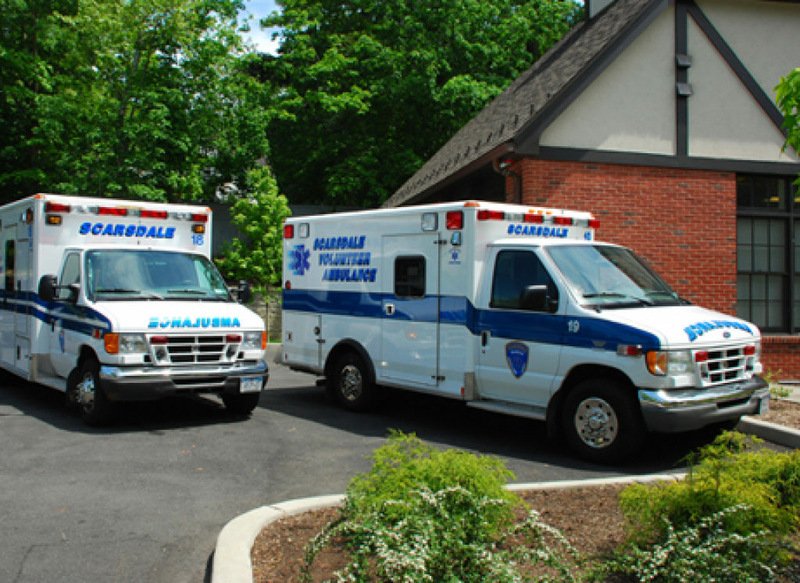 Phelps Memorial Hospital's Hoch Center for Emergency Education, in conjunction with Scarsdale Volunteer Ambulance Corps, is offering a NYS certified EMT-B (Emergency Medical Technician) class, from Sept. 3, 2014, through March 19, 2015. Course lectures will be held at SVAC headquarters (5 Weaver Street, Scarsdale) and practical skills labs will be held at the Hoch Center at Phelps Hospital (755 North Broadway, Suite 200, Sleepy Hollow). Classes will meet Mondays and Wednesdays, from 7 p.m. to 10 p.m., and approximately one Sunday per month, from 9 a.m. to 1 p.m. The class is open to the public (must be 18 years or older, as of the course's final NYS exams on March 14 and 19, 2015). There are no prerequisites to enroll. The cost of the class is $725. However, the class is being offered free of charge to current and prospective SVAC members and Scarsdale volunteer firefighters. Tuition will also be funded for other volunteers or employees of a registered or certified EMS agency upon attaining the EMT-B certification. 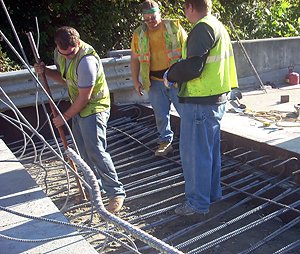 Upon completion of the class, participants will be graded on a NYS practical skills exam and a NYS written exam. Successful completion of these exams will earn participants a NYS EMT-B certification, valid for three years. It is anticipated that the same course will be offered again, from January-May 2015. For further information about the Sept. course, including a full schedule of class dates, times and topics, please call the Hoch Center for Emergency Education at 914-366-3577 or SVAC at 914-722-2288. You may also visit SVAC's website at www.scarsdalevac.com, where the course syllabus is posted online. Pre-registration is required at cee@pmhc.us or by calling 914-366-3698. Before Kindle and Nook we had these things called books! 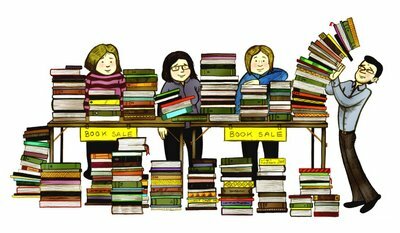 The Friends of the Scarsdale Library announces their upcoming book sale which will begin on Saturday September 6, with a very special preview for the Friends on Friday night September 5th. We stopped in and saw thousands of books piled in the Scott Room where volunteers kept busy sorting through novels, classics, and cookbooks. It is not surprising that with electronic devices becoming more popular that physical paper books are being donated by the thousands to this years sale. According to Kathy Steves, who is the librarian at Cardinal Spellman High School and directs the Scarsdale Library book sale each year, she was surprised by the sheer number that were donated this year. The library will be accepting donations through Saturday August 23rd, with the sale to begin on September 6th and run through September 15th. Big news for Scarsdale Football has kids buzzing as Art Troilo Jr., longtime Harrison coach, will join the Scarsdale coaching staff. Verboys said Troilo will coach one of Scarsdale's two junior-varsity teams, and help the varsity and coach at the youth level. The Scarsdale Village event takes place downtown Sunday, Sept. 21, 11AM-5PM With over 70 restaurants, 200 wines from top-notch producers from around the world, craft beers, and top celebrity chefs, you can spend all day tasting, smelling, eating, drinking, learning, and watching. Enjoy live music from rock legend Gary U.S. Bonds and others, Modell's Kids' Zone, cooking demonstrations, book signings, and the company of your neighbors and friends. Mingle, mix, taste and sip with the best chefs in the county. Help yourself to an ocean of eats, drinks, and the signature dishes your favorite restaurants. West Nile Virus just found in a mosquito batch that has tested positive for the first time this year according to the Westchester County Department of Health. The County Health Department staff collected this mosquito batch in New Rochelle and sent to New York State Department of Health for testing. Last year, seven positive mosquito batches were found in Westchester County and two human cases of West Nile Virus were reported. So far this year, there have been no reported human cases. The Health Department will continue to trap and test mosquitoes and survey catch basins for mosquito larvae or standing water. We will continue to keep you posted with health alerts! Amanda is thrilled to be able to offer fellow NYers in Scarsdale her favorite LA-based workouts – SLT. After hearing her friends in LA rave about the effectiveness of the unique Pilates meets cardio meets strength training workout, fitness-enthusiast Amanda had to try it for herself. One class and she was hooked and found herself planning her West Coast trips around her workouts. Tired of having to fly across the country to get her fix, she decided New Yorkers needed a studio of their own and she opened SLT. The roster of instructors is fantastic and includes: Stephanie Petruccio, Marisa Olszewski, Tracey Forte, Marcy Modica, and Leslie Greenwood. Amanda was also the Co-Founder and CEO of Vital Juice, the leading healthy living e-newsletter publication. Amanda has a BA from Duke and an MBA from Harvard Business School. Come check out SLT located right across the street from Five Corners Properties at 2 Palmer Avenue and tell them that you heard about their fabulous program from Five Corners! The Junior League of Central Westchester (JLCW) invites women living or working in Eastchester, Greenburgh, Scarsdale and White Plains to its semi-annual “Recruiting Coffees” at historic Wayside Cottage on September 18th at 8PM and September 19th at 9:30AM. The JLCW is an organization of women committed to promoting volunteerism, developing the potential of women by providing leadership training and improving the community through numerous volunteer projects. The JLCW is comprised of diverse women from Central Westchester and we welcome the opportunity for women of all races, religions and national origins who are committed to volunteerism to become members. At the informational coffees, prospective members will learn about the JLCW’s efforts to improve the lives of neighbors in need, as well as the activities that support these initiatives, including fundraising and development, volunteer training and communications. Joining the JLCW provides opportunities for volunteers to impact their community in a meaningful way and foster life-long friendships with fellow volunteers and members of the community in which they serve. Each year, the JLCW opens its doors to women of Central Westchester who want to become involved in an organization that makes a difference in the lives of hundreds of local children and individuals, offers training in a variety of educational and leadership opportunities, and provides opportunities for personal growth, leadership and lifelong friendship. It’s a great way to meet other diverse women in Central Westchester and get involved in the community. New members enter a training course where they work together to complete a short-term community service project. The short-term projects for new members are designed to help the community, allow members to get acquainted with the JLCW, and foster networking between new members. In Spring 2014, the New Members of JLCW partnered with White Plains Hospital to host Kids in the Kitchen in connection with White Plains Hospital’s annual health fair. Kids in the Kitchen is a program that promotes healthy eating and making smart choices when it comes to feeding children. JLCW participated in the health fair by distributing healthy snacks of apples and oranges to the children attending the health fair at a table with informative nutritional displays as well as goody bags which contained health related snacks, jump ropes and other items. The JLCW also had a table where they entertained many of the children who attended the fair by providing them with activities and coloring pages related to health and nutrition. The children greatly enjoyed the activities while JLCW helped them learn about healthy eating and making good choices when it comes to food. The coffees will be held on September 18th at 8PM and September 19th at 9:30AM at Wayside Cottage, 1039 Post Road, Scarsdale, NY. Women interested in learning more about the JLCW should RSVP by September 17th to jlcw @verizon.net or by phone to (914) 723-6130. More details are available at www.jlcentralwestchester.org. The Junior League of Central Westchester (JLCW) is an organization of women committed to promoting volunteerism, developing the potential of women, and improving the community through the effective action and leadership of trained volunteers. Its purpose is exclusively educational and charitable. Headquartered at historic Wayside Cottage, the JLCW has served the communities of Eastchester, Greenburgh, Scarsdale and White Plains for over 65 years. Our approximately 250 active and sustaining members are accomplished collaborators who identify community needs and develop effective and responsive programs to serve those needs. The JLCW invites women of all races, religions and national origins who are committed to volunteerism to become a member. Scarsdale drivers will face road closures related to the ongoing Crane Road Bridge Replacement Project have "ramped up" and will run through Friday, Aug. 8 on the Northbound Bronx River Parkway, the Northbound Entrance Ramp from Crane Road to the Bronx River Parkway and on East Parkway, the adjacent local street in Scarsdale. Now NoMa Social has brought in Port Chester's F.I.S.H. executive chef Bill Rosenberg who exhibits suburb talent, with a flair for the seasonal. Seasonal specials are always worth considering. Sautéed first-of-season soft-shell Florida crabs stacked atop jasmine rice with soft strands of fiddlehead ferns, piled high with microgreens, on a plate slashed with roasted red-pepper purée and sweet corn coulis. Delicate fennel-spiced rare tuna came with tabbouleh amplified by black-olive vinaigrette.